It all started back a few years ago back in 2006 when I was playing around with Mame and bought the X-Arcade dual stick. It did the job initially but did quite feel the same and I soon realized that I needed to have my own arcade cabinet to bring back that nostalgic feeling as a kid growing up in and playing video games in arcades. I found some plans with measurements on making a cabinet from scratch using MDF but I am not a very handy person when it comes to working with power tools such as saws, drills, routers, etc. On top of that I don't own any of them except for a drill so the cost of investing in all these tools wouldn't justify it since I would only use it for this project so I went looking for a used or gutted arcade cabinet. I searched for weeks and after about 2 months I came across a mint original Mortal Kombat II cabinet which had the Raiden with lightning artwork on the sides for $400cdn. The guy selling it had it in storage and was moving out of the country and needed in gone within 2 weeks. I figure I would spent more than $400 in buying decent quality tools and wood so a week later I picked up the cabinet. During this time I was also doing some research and found a way to make use of the arcade monitor in the cabinet by using a J-PAC and ArcadeVGA from ultimarc.com. Fast forward 2 weeks later I went with two friends, one of whom had access to a cargo van to pick up the MKII cabinet and boy was it heavy. We pulled up into the driveway at my house and carefully unloaded the machine. We decided to take a quick break and come up with a plan as to how we were going to get this huge cabinet down to my gameroom in the basement. Fortunately there was a power outlet nearby so I plugged it in and we fired it up and started playing it outside on my driveway while we brainstormed. Neighbors and kids were walking by and some cars were stopping to stare at the intersection to watch while we performed gory fatalities on each other. Anyways after about 15-20 minutes of fun we decided it was time to get it inside and i was so set on having this cabinet that I should have measured the stairs going down to my basement. There was maybe a one finger gap on both sides and going down also involved making a complete turn around a corner. So there it was, my dream of having an arcade cabinet in my games room which already had a 4' x 8' pool table and Fabi jitz table was crushed The MKII cabinet had to stay in my family room upstairs and my girlfriend wasn`t too thrilled about that. That was all I ever did with it and hung on to it hoping one day I would move to a bigger house and be able to include it in my game room. This past December I ended up selling the machine because my first baby girl was due soon and we could use the extra room for swings, playpens and bouncers. February 2009 was the month Street Fighter IV was being released and I got bit with the arcade bug again. It took me a few weeks after the release but I was able to get myself a Madcatz SE fight stick for my xbox360 and before that I even paid a local guy to build me a custom fight stick using Happ parts. I was a bit disappointed with SFIV to be honest and even though the graphics looked very nice it just didn`t have the same feel as SFII. I decided to take advantage and sold all my fight sticks for a decent profit as there was a huge shortage up here in Toronto, Canada. I also recently learned that my brother in-law George`s brother in-law William was retired and sold his wood shop. He had all the tools and experience necessary to help me build a cabinet from scratch. After some more searching on this forums I found a link to the http://jakobud.com website which had the Dynamo Showcase cabinet plans with measurements. This cabinet would be perfect for me because it comes apart in two pieces and could be easily moved downstairs in my basement. This cabinet also works great for me because I had an old Panasonic 27" Tau television that wasn't being used and didn't have to be mounted on an angle like the more traditional arcade cabinets. I printed out the plans from jakobud.com and went to show William. I read in another thread that some of the measurements were not consistent in the plans so in an hour we were able to complete the top control panel and podium portion with 2 shelves below it. I will take pictures of the cut wood later because they are sitting in William's garage but I did take the control panel back home with me so I could do some planning. Last week after sending some emails back and forth with RandyT at groovygamegear.com I placed my order and it was shipped last Saturday. I got an unexpected call from my girlfriend at home at 2pm and I knew what it was about and she was calling to let me know a package had arrived and what was in it because the customs invoice was over $300. Busted... not really. She makes fun of me and my other friend when it comes to stuff like this referring to us as "dweebs" or "dorks"
A bunch of Happ buttons in various colors. Most of my player controls will stay true to what I grew up with in the arcades which is the standard red, white and blue. Happ dedicated 4 way joystick on the right and two Happ 8 way competition joysticks with GGG exclusive microswitches. I was on the fence about this one having been sold a custom xbox360 fight stick claiming to have Happ Competition sticks and they performed poorly to my standards and what I recall back in the day. I soon learned that back in the day the machines I played on had sticks made by iL and my friend showed and let me feel the difference. That is why I am missing the other 2 player controls in the middle of my control panel for Street Fighter. The guy is ordering them direct from iL which is based out of Spain I think, I hope it comes before the weekend because I plan on test fitting everything. Hinges to possibly secure my control panel and a Happ button wrench to save me from getting a ton of blisters on my hands. Here are a bunch of quick disconnects to hook everything up on the control panel. My friend who rebuilt his control panel on his SFII CE machine told me to get extras in case I messed up or needed to recrimp due to a bad connection or contact. Turbo Twist 2 USB interface with TT2 Designer Series™ Premium Spinner Knob. I chose to have the Mame logo because I plan on following a Mame theme throughout my cabinet later on. That is pretty much it for my order from RandyT and rest of the parts I bought used from a very nice guy on the KLOV forums. Things worked out great because he was from Minnesota and had to make a drive out to Toronto for some personal business so I was able to meet him at a hotel near the airport last weekend and picked these up. Arcade coin door with keys but no coin mechanisms. The door appears to be in pretty good shape and for right now I want to have it to complete the arcade look. Once I get all the other stuff taken care off I might go on ebay or search a local arcade supplier for coin mechanisms and wire it up to take quarters. Here are some extra parts I had lying around or donated to me for this project in return for "free play" when they come over to have some fun. This set of Altec Lansing speakers werd donated by my good friend Sergio who is probably one of the craziest arcade nuts ever. I will take a picture of his place later and show you guys. The really nice thing about this motherboard is it has multiple ways to output to a TV, plasma or LCD. It has HDMI, DVI, S-Video and Component (red, green and blue). I will be using the onboard sound card and LAN to do the occasional update through the network or internet. That is it for now and here is a little teaser pic of things to come so stay tuned and check back later when I add more pics of progress. I just placed my order at Mamemarquees.com and Scott emailed me and said he will most likely start printing my stuff tonight and ship it out early next week. That's my showcase project you found. I'm glad it inspired you! If you have any questions, let me know and I'll try and help you out if I can. 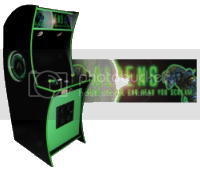 Future plans for mine are to add MAME using the original control panel. The 49 way sticks are what's holding me up. That was my problem with the original MKII cabinet I bought, there was no way in hell I could get one down the basement stairs Good thing the WAF was just enough to put up with having it stick out like a sore thumb in the living room for almost 3 years. Thanks for the offer Tom and I think it is a great idea to add Mame but in order to take advantage of more games you would need to add some more buttons unless you aren't really into fighting games like Street Fighter and Mortal Kombat. I personally like those games and spent countless hours and quarters on them as a kid. My friend Sergio has a SFII CE cabinet and recently sold him my J-PAC and X-arcade and he was so glad he has Mame in his cabinet now because he actually uses it more. Playing SFII can only be so fun for so long solo. Where did you get that control panel from? I don't think I have ever seen one like that in person before. Quick question...you mention it is hooked up via component? 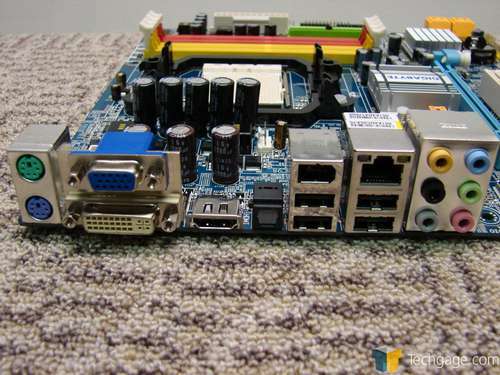 When I look at this motherboard online I see a vga/dvi and hdmi connector but no Component? Are you using a dvi -> component adapter? Looks like it's going to be good. Enjoy the ride! yes this looks like its gonna be an awesome cab. I love a good showcase cab. No adaptors used at all, it came with a add-on plate (item to the left of the user's manual) which has the component and s-video ports. If you look at my computer picture above I had to remove the full sized plate because the case I have the computer in is a low rise style case. Then it is connected to the "TV" pin headers shown above on the motherboard. 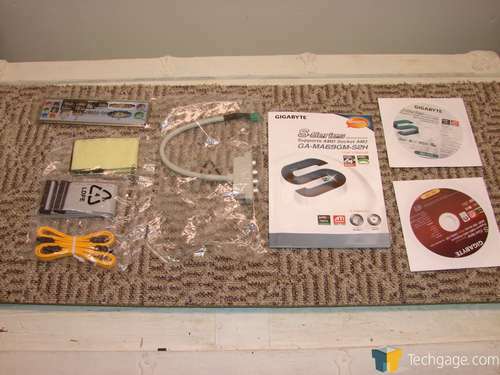 This motherboard was the ideal motherboard to use for a HTPC as it has a ton of ways to output to a TV. 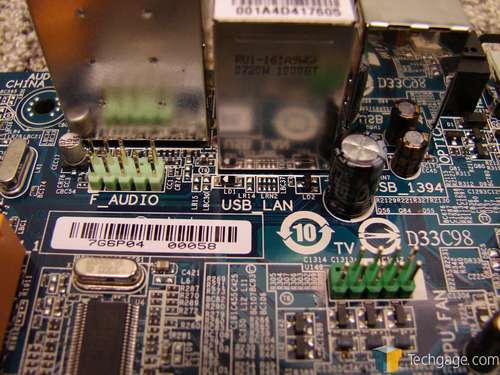 If you check the back of the motherboard you have your standard analogue and DVI monitor connections or HDMI and for audio there is the optical Toslink connection too! Thanks for all the words of encouragement guys, I'll probably have more pics and have all the buttons and joysticks test fitted by end of this weekend if William is around and not busy. Have a great weekend guys! Fantastic! I had no idea there were Motherboards with component built in...for mame and my tv this will save me a lot of $$. Thanks for the tip...now hopefully i can find a mb with these features if yours is no longer being made. Here is a better pic of the connector I found online but yeah it is a shame that the later models never came with this option or add-on. It works great with my old 51" Toshiba projection tv which I used the component to output from the computer. The only reason I stopped using this as my main HTPC was because I was having some trouble playing back H.64 blu-ray rips so my main one uses the 790G chipset with SB700 Chipset ATI Radeon HD3200 Graphics. There is one auction on ebay right now for a refurbished one that is missing the I/O shield. The seller has buy it now for $69.59 or best offer. You could try to lowball and see if they will take and from the picture gallery I see it does come with the component add-on too. Thanks I will take a look at those links right now. Component is key for me with the older 27" SDTV (with component in) I am using...S video and composite are no match and this MB would mean I don't have to buy a video card for mostly mame/console gaming. My showcase began by buying the monitor, game boards, control panel and wiring from a guy that was turning a real Gauntlet Legends cabinet into a MAME cab. I took the electronics and Jakobud plans and built all the wood parts based on the plans with modifications to make sure it fit my parts. What's kind of cool about the control panel is that it has speakers built in, so I could narrow the cabinet width by not adding speakers to the sides of the monitor. I love seeing peoples 'stuff' before they start putting it all together. Looks like it will be a nice one! What's kind of cool about the control panel is that it has speakers built in, so I could narrow the cabinet width by not adding speakers to the sides of the monitor. Well right now I have the sound hooked up to my TV and having second thoughts about even using the Altec Lansing speakers my friend Sergio donated to me. I know these speakers pound but they are also awkwardly shaped so I don't know. Once I have the podium portion assembled I will see how much room I have in there and I might put the speakers in there as optional sound in case I ever wanted to use the podium as a stand alone unit from my 27" TV such as hooking it up my 50" plasma in the living room via HDMI. Right now I am able to play emulators on my HTPC using authentic Sega Seturn USB controllers or my Madcatz SE with Sanwa swapped parts. I'm hoping I can make some progress on it today with the control panel but my girlfriend's friend just moved in yesterday and all her stuff is in the basement and I have to take care of my daughter while they sort the stuff out and re-arrange our storage area. Very cute! My daughter's 5 and she's been helping my with this build since she was 3. Lots of fun! About those speakers, have you considered decasing them? Look what came in the mail yesterday My artwork from Scott at mamemarquees.com arrived. Control Panel artwork. I decided I didn't want to go with the plexi route like most people do and the material Scott uses feels pretty durable and the way I think arcade machines should be. I don't have to worry about my friends or other goobers resting their cigarette on the control panel. Now I just need to get drilling and routing so I can being wiring up all my control board interfaces. To keep consistent with my lightning control panel theme here is the kickpanel artwork of Raiden which I am going to place directly below the screen once I get that built. 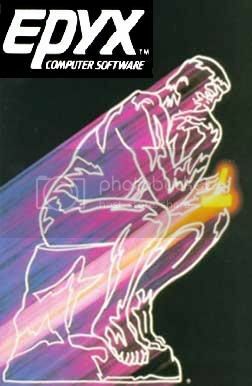 I ordered a string of 100 white leds and I plan on mounting this artwork onto a piece of plexi so I can illuminate the lighting and possibly eyes with different effects such as fade in/fade out or flashing or constantly on. Then we started to cut the wood for the podium that the control panel is going to sit on top of. As you can see from the last picture I also closed off the back with some hanging board William had lying around. I figure this would be the best to use instead of enclosing it with a piece of MDF because the holes at least allow for some air circulation. Next thing we did was test fit the over/under coin door and was just fine with a bit of shimming which I will do later on after I prime and paint. Last shot of the day with some of my controls dropped into the control panel. I am still waiting for my iL parts for the SF player layouts which have taken over a month But I'm sure they will be here this week. Stay tuned for more progress pics. Now the fun begins, wiring. This is shaping up well! Great job on the control panel artwork. How hard is that to apply? Then I slowly pealed away the rest of it while my cousin was applying it on top to make sure no air bubbles formed. It's not as hard as it seems even though I hesistated for a few days only because it an expensive piece, $70usd!! I know Scott is a good guy and will send you replacements free of charge only if it is his fault. I am very happy with the end result and didn't want to go with the plexi route over my control panel and this material Scott @ mamemarquees.com prints on is top notch and highly recommend it. I started the wiring last night using cat5 network cable but only got the SF sticks and buttons wired. I had to go to bed because I need my bare minimum 4 hours sleep but I will post more pics last on this week once the wiring is completed. man i wish i wouldve had some documented plans when i built my showcase back in '04. yours is looking sweet! nice and clean. Wow Hulkster, happy 5th anniversairy to your MAMESTROSITY showcase build then Some of the links on your site are broken and I wish I had taken more pictures but I wasn't sure if anyone was watching my thread so I didn't get a chance to take any but who wants to see the primer and paint stage anyways. So far the wiring has been pretty easy with the help and organization of cat5 network cable. I hope this is good enough and I also figure if it is good enough to transfer files then it should work fine with joystick and buttons. I know Delusional used the same thing on his cabinet. Now my only doubt is if I crimped the quick disconnected properly. So far all I have been doing is stripping the wire, twisting it, folding it, insert into the QD and crimp. Hulkster, do you mind sharing or making a few measurements for your TV portion because I plan on getting that part knocked off pretty soon. My podium will be spaced a lot further then yours from the TV but right now I am looking for some other ideas. Any tips or things you would have possibly done differently would be greatly appreciated. My LED lights also came from dealextreme.com too! Maybe if I get around to it I will go buy a piece of plexi and apply my Raiden artwork to it and then line up the LED lights behind the lightning and Raiden's eyes. The unit comes with a neat control module that allows for the LEDS to be on solid, fade in fade out, flickering, etc. Wow! This is going to be a sweet cab. Great work! well i didnt have any plans when i started, and as a result, i didnt really make any plans along the way im not a carpenter AT ALL, and as for my tv stand part, honestly i just put the tv i was going to use on top of the initial piece of wood, and then just kinda measured around it and said "ummm, yeah that looks good, and i'll add a couple of inches on each side....and sweet, it fits!". yeah, so those are my "exact measurements". sorry man, i wish i could help you more, but there are far better showcase cabs out there than mine that are much more precise and clean (like yours is looking! ). mine wasnt a hack job because i took a long time to make it and i measured 5 times and cut once and still made mistakes...albeit they arent visible thank goodness. but if you saw my cab in person you'd be saying "dude, you shouldve done it this way and it wouldve soooo much easier". yeah probably. the one difference mine has over others i believe is that i didnt completely close my cab off at the back. as in, there is no back to the monitor section or pedestal section. reason being is that my cab always has its back to the wall and it doesnt have wheels so i wont be moving it around. no one ever seems to want to look back there anyway, so its not an eyesore. the reason i tell you that is because i didnt try to make a perfect box so that my tv would fit completely in and be closed off. some would cringe at that thought because its not a completel replica of whats in the arcades. i agree, but thats just what i did probably just because im lazy. one final thing....and since youve already drilled your cp and stuff then this is probably for nothing, but i spaced my 3rd and 4th player controls out on each side a lot wider than the normal gauntlet cabs or traditional showcase cabs. im not a huge guy, but im 6'3" 230lbs so elbow room is important for me. i didnt want someone next to me being all close and stuff...crowding me. i didnt have that problem when i was 10 because we were much skinnier back then i put my drawings for my buttons and joysticks taped down on the cp before i drilled and then i had 3 of my friends crowd around, and i made adjustments from there. just a suggestion. I live in NYC and dont have as much space as most, but I want to make an arcade machine but do it a little differently. I want to make something simliar to the Showcase model, but instead of the 2nd frame with the monitor, I am just going to mount an LCD on the wall. I know it wont be the same as the old arcade CRT look, but I basically just want to build the front podium and control panel. Does anyone have a guide or dimensions I can use to build just to podium an control panel? I went to that website, but the Gauntlet plans listed just look like the old one piece arcade machines. Does anyone know where the showcase plans are? Thanks alot for your help guys! PS...Anyone that wants to build the podium and control panel and ship it to me, I would definitly be willing to do that! Let me know if anyone is interested in helping with this. You can check out NorthCoast Custom Arcades for control panel stands and control panels. But for the price you pay you can make it yourself for a fraction of the prices listed on the website. My podium is essentially stand alone as I have not yet started working on the other half for the TV monitor yet. I've played it many times with friends with my Panasonic tube TV and it has even made the trip over to a friend's house for a birthday hooked up to a wall mounted plasma. It was certainly the center of attention that night for sure with people playing NBA JAM, Blitz and Golden Tee. - Spending as much time as I can with my daughter everyday when I get home from work, who has now learned how to be mobile and crawling forward for the last 2 weeks. - Sister in-law had a baby boy back in August but found out from her landlord 1 week before her due date that she had to move out of the house they were renting because he wanted to sell the house ASAP. I had to help them find a new place to rent, pack and move. They use to live about 1 hour north of Toronto in a city called Barrie but now they live just 5 mins down the road from me. I have a friend who knew someone that had a vacant house which needed a lot of work but rent was cheap to compensate. This move actually made sense since my brother in-law would spend 3-4 hours commuting from Barrie to Toronto, so this move not only saved them money but time as well. to the landlord for giving no notice, he's lucky my brother in-law doesn't take him to court and sue cause he will win for sure. - Work has also been keeping me very busy with lots of traveling and in the last two months I've been to Northern Arizona, Shreveport, Arkansas, Southern California, Reno, Northern Mississipi and Lousiana. It must have been fate because everything worked out just fine and I ended up returning my wheel to Walmart since the setup came with one already. 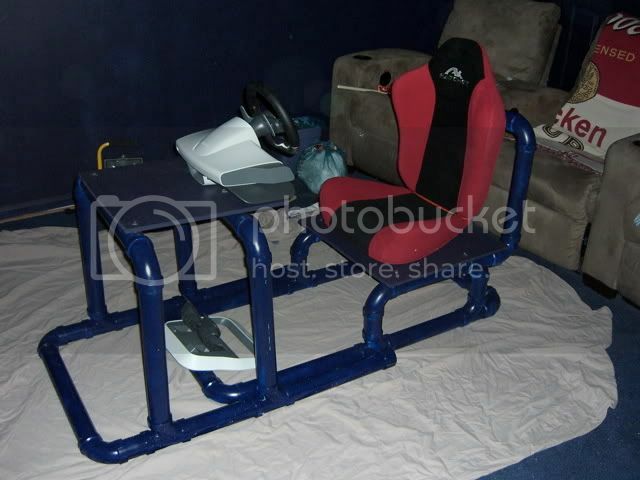 Now I finally have use for my 51" projection tv down in the basement because this racing seat takes up too much space in the living room upstairs. I don't mind anyways because my plasma upstairs is wall mounted above my fireplace and the projection is just at the right level when in racing position. This is my first timing wiring arcade parts and it went quite well with the exception of a few bad crimps for the common ground which were easily traced because I didn't put all my eggs in one basket and grounded each player's controls in it's own series. Here are some pics that I took from underneath to show my work, nothing special and I tried to keep things as neat as possible using cat 5 network cable. I probably would have done a few things differently but maybe in my next cabinet because everything worked. Because the bottom of my control panel is open from underneath on the sides I am able to hide and map three micro switches to the GGG Keywiz for admin functions such as "ENTER", "TAB" and "ESC". I also got some more groovygamegear goodness from Randy and changed the bat top to the Versaball 2 on my dedicated 4 way stick. I was debating on replacing the coin drop bulbs with LEDs but found a way to wiring them up using the 12V power from one of the molex connectors on the power supply. So they come on when I turn my computer off. They are not as bright because I am under powering them with 12V instead of 14V, regardless this only took me 5 mins to wire up and maybe in the future I will put in the LEDs. On the topic of power, I also zip tied two leaf microswitches behind the coin drop buttons. If you press the left coin drop button it will give you a credit in mame and the right one is used to turn the computer on and off. Here is a quick shot of the inside with my motherboard mounted using the copper stand offs that come with computer cases. I don't know why people use BIC pens or buy plastic PCB standoffs when all I did was drill a hole and then screw in these copper stand offs. Holds pretty well and costs $0.00 The inside here is far from complete because I need to figure out how and where I want to mount the power supply and hard drive. I know Im late to the party but is there a reason why you angled the players 1 and 4 sticks? that totally kills the ability to play smash TV n stuff or are players 1 &2 and 3&4 wired in parallel? I don't play SmashTV anyways and I guess it is angled to flow with the top of the control panel? Most people angle P1 and P4 when they do 4 player control panel from what I have seen but only use 3-4 buttons only. I don't know why when buttons aren't that expensive unless they don't want to clutter their control panel or not enough inputs on their interface boards. Another reason I did this was because I hated playing on Bootleg MK cabinets that used the Capcom straight 6 button layout and wanted to play MK the way it was designed to be played. It can be a bit awkward playing MK but you get use to it pretty fast. As for the wiring I have two interface boards, P2 and P3 are hooked up to a Key-Wiz and P1 and P4 are hooked up to a GP-Wiz. Most factory 4 player games don't angle the sticks for 1 & 4 , a bi-product of that is being able to play games that use 2 8 way sticks, like Karate Champ (I love that game), smash TV, robotron, total carnage,etc. If you don't play those games then that's no biggie. I'm not knockin' your project at all, in fact I think its pretty awesome so I hope you weren't taking this feedback negatively. That cab is sweet I never saw this before . Do you have any more pics with the raiden art and the leds installed? I haven't built the other half of it to house the TV and the raiden art with LEDs but I plan to get around to it this summer. I think I plan on revising my plans and making it a dedicated corner unit to save on space instead of building it square like the traditional Dynamo showcase cabinet. That sounds real cool, can't wait for the update.